The sand is moving illegally... and then over speed...Inexperienced,Without license ..With the desired driving People are scared.Excessive speed is becoming increasingly dangerous for people.What's going on with fast looming vehicles?People are getting bored in the insecurity.Recently,carrying a sand tractor went into a house in Malkapur. The sandy tractor was sealed by an overnight surge in the corner near the Bypass in the same suburb. Despite the damage, road traffic was filled with sand and the traffic of other vehicles was interrupted. As soon as possible, the sand tractor was moved from the case. Eight passengers lost their lives in an accident near the Malkapur bypass last year. The villagers were worried about the sand tractor near it. Thousands of small and large vehicles will move to mineral wealth in Odisha villages of Kajpuri, Asifnagar, Elagandala, Kamanpur, Badipalli, Nagallamalaiya and Gangadhara mandala. The people of these villages are shaking the road if all the vehicles are passing through Kanpur, Chichikunta, Malkapur, Lakshmipur and Rekurti villages. Many accidents have occurred due to the overriding speed of other vehicles from Sandeep, Asifanagar, Nagulmalaya, Odariyar, Kamanpur and Badipalli villages, granite and trucks, Drivers do not control the speed unless people have to run away at the speed of those vehicles. If the Transport Department needs to be flogged on the fast passenger vehicles without hindrance, no action is taken. Due to the lack of intermittent checks, there is no fear. Driving without driving licenses without driving and driving as a driver. The villagers have complained that despite the falling of granite lorries, tractors of illegal sand transporters do not have to be overrun by the villagers. Revenue, police and mining officers are unable to stop the smuggling of sand. Traffickers are struggling with the speed of tracking the tracks of the others as they are afraid of looking at the authorities. Sandy mafia is faint when it knows that the extreme danger is dangerous. Drivers who are not licensed are often hazardous to the tractor as they appear as labels drives. On December 22, a sand tractor was rolled out at Malkapur's former sarpanch. The road was filled with sand and the journey of others was interrupted. 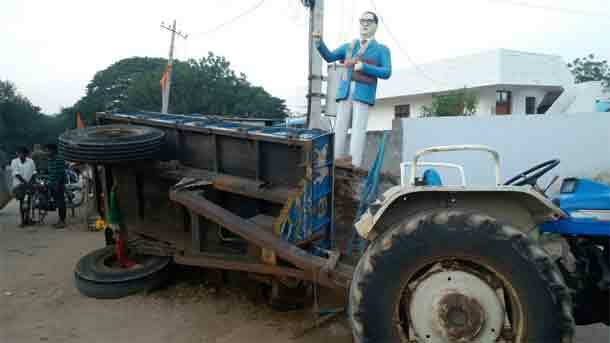 The villagers want to take action on the sand tractors that are in the interest of the dharna.